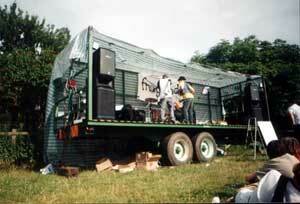 Frogstock is a little festival organised by myself and my family and friends and held in a field out the back of my parents house. We open our field and spend whatever we can afford on some beer and a music system and put up some tents and the rest is provided by your generosity. 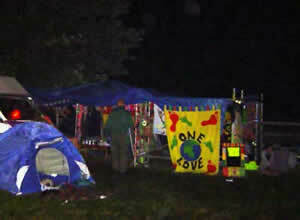 Friends and neighbors bring generators, musical equipment, tents, beer and food and whatever they want to offer. 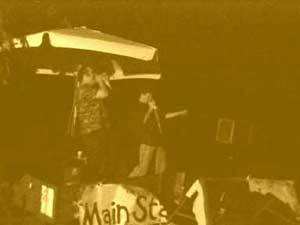 We provide a stage and we do a turn to get the whole thing going, then we we invite musician and performers and whoever feel inclined to unleash the rock. We all pitch in and have a good time, not for money but for old fashioned misguided ideas like fun and love. It’s like Christmas but better and in the sunshine. "It is inspired by hazy memories of the Norfolk & Suffolk Fayres of the 70’s and early 80s when hippeis would recreate medieval village fayres by smoking dope in tents and eating wholefood and performing folk dances. 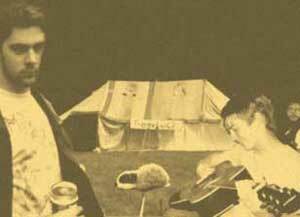 It is inspired by the myths of a young David Bowie playing a few tunes in his mate Michael Eavis’s field and inventing something that would someday become The Glastonbury Festival. It’s inspired by some young boys drinking in field listening to a Nirvana songs played on a crackly battery operated tape recorder and wishing real rock bands would play on a big stage in their field and all their friends would come... and one day they did". 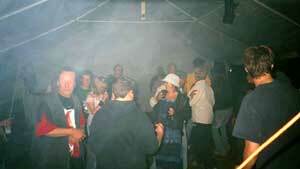 The true origins of Frogstock are lost in the mists of time and the fog of drunkness. 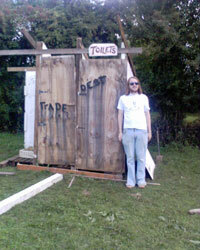 Folklore has it that Frogstock was invented in the spring of 1995 when Frog Morris and 3 school friends set up two tents and campfire in a field. Something happened and that summer more and more people came to Frogstock. Between 1995 and 1996 there are estimated to have been 5 Frogstocks (including one rare indoor Frogstock at Christmas from which structural damage to the farm house can still be seen). The years passed and Frog Morris grew up and went to art college in the big city where he met city folk who he was surprised to learn had never got drunk in a field. Frog felt sorry for these deprived city people and got to thinking that maybe if he brought back Frogstock he could do some good. He also realised that he would spend £100 on tickets to a big corporate festival to listen American corporate rock bands and only be allowed to drink overpriced pints of horrible lager OR he could spend the money on a big tent and some cheap horrible larger and get loads of people drunk and get some cool bands to play... and so Frogstock was reborn for the new millennium. At first no rock bands came and nobody really believed it would happen. But Frog did not loose hope. 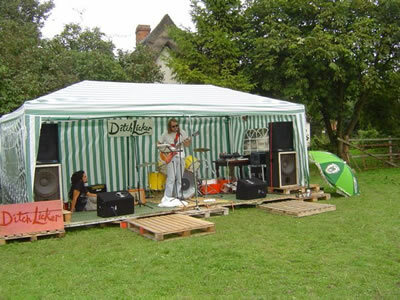 He entertained audiences himself with a puppet show and everyone enjoyed the party. 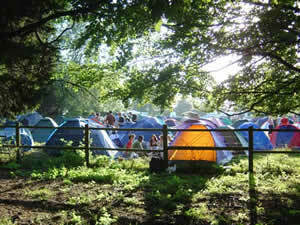 And everyone who came told their friends that there was really a little festival and people did turn up and have fun. The next year still no bands turned up. But a few friends did come with drums and guitars this time. 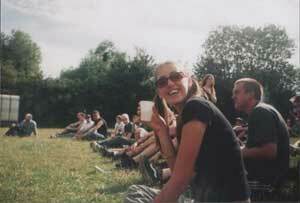 In 2003 even more people came, some say there were 500 people. 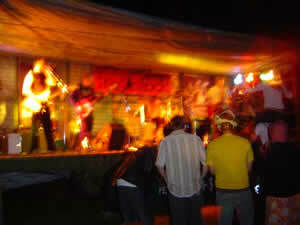 Rock bands journeyed to the Frogstock field and there was also a dance tent, camp site, refreshments, parking, toilets, catering, promotional t-shirts and a website. 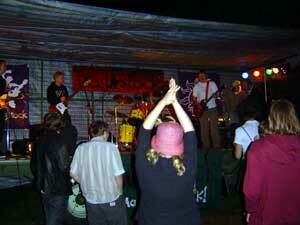 10 bands played including The Moon Office, The Exiles, The Blo Boys, Opposite The Hotel, Skrewworm and Vote Bob. 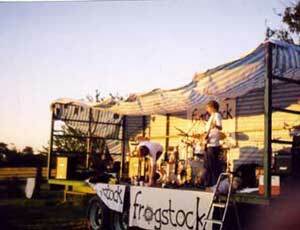 2005 saw the biggest Frogstock ever with 6 stages and all kinds of entertainment from folk music to Drum n Bass running from Saturday afternoon to Sunday breakfast time. Ther was also market stall, food and a full bar with a fine selection of local ales! 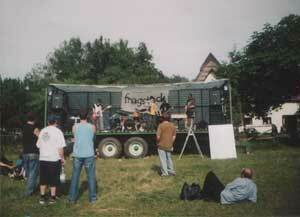 Then in 2006 Frogstock took a break so as we could to reflect on the last 10 years of hard work. 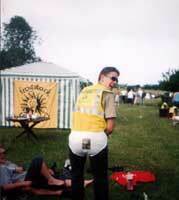 As the festival got bigger and more money and worked inevitably got involved we began to wonder why we did it? 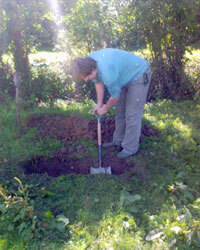 Above : Preparing for another festival - digging another trench for the traditional festival toilet, racking up another barrel of ale. 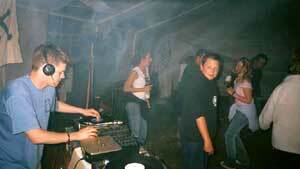 We held a smaller event called DITCHLICKER in an attempt to rediscover to the roots of the festival . There was music from our friends Victor Mount, Skrew worm, Opposite the Hotel, The Blo' Boys, One Foot Skank and the Ophopaedic Cheese Surgeons as well as Poetry by Frog Morris. Everyone had fun even though it wasn't as big. 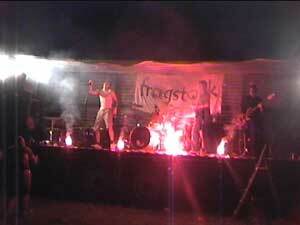 Did we want Frogstock to be the next Glastonbury? Not really. Frogstock was a response to the big money festivals where you pay loads of money for tickets and once you can get in you can only buy the promoter’s brand of dirty larger and only listen to the bands that sell loads of records and pull big crowds. We wanted to create our own space where we could put on our own kind of entertainment and drink nice beer. 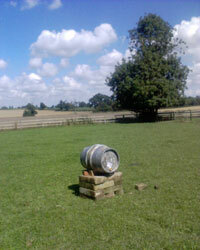 Out in the Norfolk countryside there was nobody about to tell us what we shouldn't be doing so we made our own rules. The Frogstock project continues as a space for performers that doesn’t quite fit into the conventional spaces of art galleries, comedy clubs, music venues or burlesque cabaret yet still have something to offer. Some moments will be profound, some moments will be funny and some moments will just be rubbish.